Breakout Rooms could be thought of as a mini Collaborate session inside your Collaborate session. They have most of the features of the main room, such as audio, video, whiteboard and application sharing. They can be used for many things such as large class activities, group work or private meetings. Public rooms can be created before the session starts or on the fly during the course of a session. 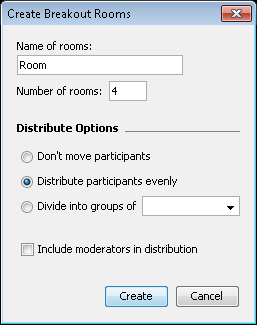 A set amount of rooms can be created or rooms created depending upon the number of participants. 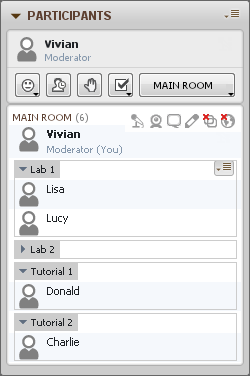 Users can be randomly distributed, select their own room to join or be individually moved by the moderator. Interactions and content that is created on the white board in a breakout room will not be part of the main session recording. However white board slides can be saved and/or “pulled through” into the main room where they will then become part of the main recording. Often some group work may be done in the breakout room but the important points be discussed with the whole class in the main room. There are 2 different types of breakout room in Collaborate. The Public Room and the Private room. The main difference between them is that a private room is normally used in a 1 to 1 situation. For instance if there are several students connected to an instructors “My Room” for an office hours session, it may be appropriate for the instructor to start a private breakout room for confidential discussion with a specific participant. As with all kinds of breakout rooms private rooms are not recorded but the any slides created in the white board area can be saved. Where this differs to the Public breakout room is that when the last user leaves a private room the room disappears for good. You can’t go back so make sure you save any slides before you leave. Pre-load a number of different activities into rooms that students rotate through over a fixed time period. Students might be randomly grouped using breakout rooms to complete a group task. Ideas/answers can then be exchanged in the main room. The cohort might already be divided into working groups so breakout rooms could be used to allow groups to work independently of each other whilst still allowing the instructor to move between rooms offering support where required, blurring the line between tutorial and lecture.